NEW License Tag for Learning! The Support Education specialty tag has a fresh new look! For the first time in 25 years, the tag has undergone a total makeover. 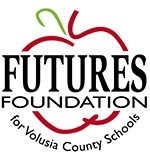 Since its introduction in 1994, more than $13 million has been raised through the collaborative efforts of the Consortium of Florida Education Foundations (CFEF) and local education foundation members across the state. While the look has changed, one thing remains the same – when Florida residents purchase or renew their Support Education specialty tag, $20 goes directly back to support education programs in the county where the tag was purchased or renewed. Funds support programs like classroom innovation, education enrichment programs, supporting and recognizing teachers, extra help and mentoring for at-risk students, school supplies and school scholarships. 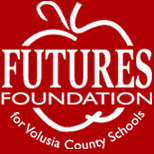 In Volusia County, FUTURES Foundation uses the funds for teacher classroom mini-grants and Take Stock in Children scholarships. Visit www.LicenseToLearnFL.com to learn more, purchase, or trade in your current Support Education tag today!